If you’ve ever driven across country, then you’ve most likely gone through the seemingly endless fields of corn here, and filled up your gas tank with ethanol made from that very same corn. Iowa has increasingly been shedding its image as a flyover state, to be a much more attractive state for businesses. It has the lowest ‘cost of doing business’ and is the 10th best state economy in the nation. There is a growing amount of biotechnology and finance companies here, with manufacturing the biggest sector. Iowa has is also the birthplace of quite a few significant people through history, including five Nobel Prize winners, and the U.S. President Herbert Hoover, and several Olympic gold medalists. With all that in mind, 5 of the cities in Iowa are among the 500 safest cities in the nation. The 25 safest cities in Iowa range from 86.81 to 59.61, with the majority of the cities above a safety rating of 70. There is an average of one police officer for every 550 residents across all of these cities, with the safest city have only 1 for every 888 citizens. Johnston is the safest city in the state, with a safety rating of 86.81. 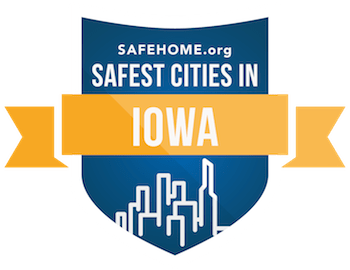 As for other cities in Iowa, there are several clustered around the state capital Des Moines that have high safety ratings such as Ames (80.75) and West Des Moines (79.31).